Floodlights can be used outside of homes for security purposes. Some can be activated by a motion sensor. 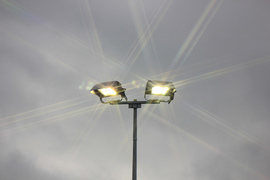 The average cost of floodlights is $75 to $150 each. If wiring is needed, it will add an average of $200 per fixture.